Windy Version 16.00 with New Impressive Real-time Lightning Strikes and More! Our weather radar has been enhanced again! Not only have more countries been added (you can easily recognise them by light-gray circles on the darker map background), but there are some really exciting improvements: flashing icons representing real-time lightning strikes, and even thunder sound effect! Therefore, this popular feature has a brand new name: "Radar, lightning". Please note, although the radar and the lightning radiolocation are both integrated into one overlay, they work independently of each other; they have different data sources and a slightly different map coverage. However, on this feature, they share the timeline occurrence; you can display them together as an animation in the time course of 12 hours to 5 mins back in the past. Do you want to help? Blitzortung is currently looking for new contributors in Africa to improve the coverage and data quality. If you have any comments or ideas on how to contribute, you can contact us here. 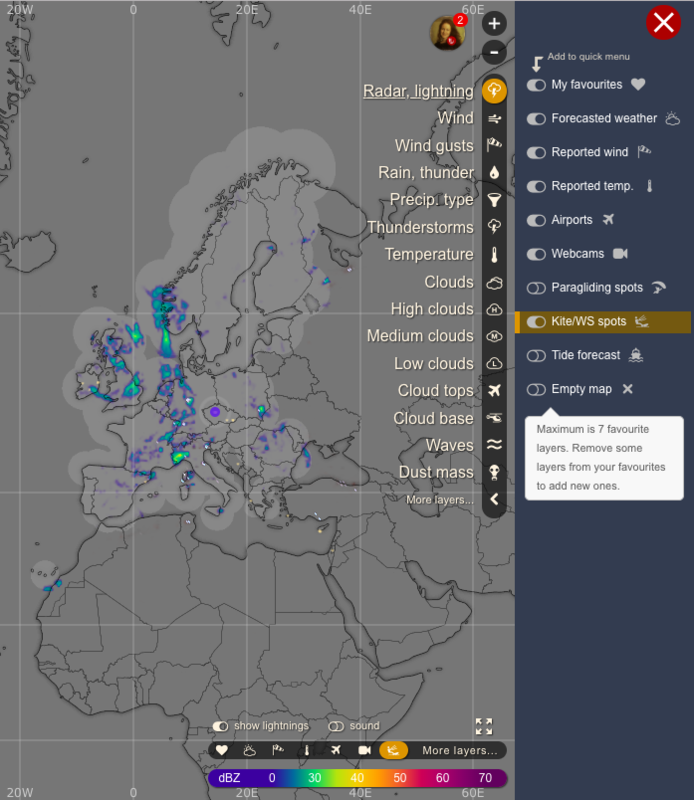 My favourites, Forecasted weather, Reported wind, Reported temperature, Airports, Webcams, Paragliding spots, Kite/WS spots, Tide forecast, or Empty map. In the PC version, you can choose from 2 to 7 POIs-related layers that you will have at hand. For more than 7 options, you need to click 'More layers' and display any on the map – with or without adding them to your quick menu. Enjoy these features and stay safe! More And More Countries Are Displayed on Our Irresistible Weather Radar Map!